I die cut eh words from white card stock. Stamped the snowflakes and added sticky embossing powder and immediately sprinkled glitter over the embossed snowflakes. It worked great. First time I tried it out. Also added Washi tape. The die cut I adhered with an eyelet and added gold thread for decoration. I love and own this die. Have even used it but not as well as you've done. Looks amazing against the dark cardstock and all those washis. I spy Santa's belt, too. Fantastic card. This is so cool!! I love that fun die and how it looks in white against the black. So pretty!! Wow, was für eine mega tolle Stanze und auf dem wunderschön gestalteten Hintergrund ist ihre Wirkung super. That's awesome! Love the washi tape accents behind your sentiment and your sparkly snowflakes on the dark background are perfect! Thanks for joining us this week at Stamp Ink Paper, hope to see you again soon! Fun and funky Christmas card, Cornelia style!!! I love it. Love the touches of gold!! Is that Santa's belt in the background?? 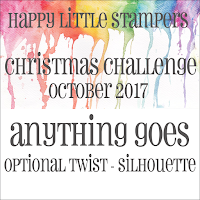 Thanks for linking up and playing with us at Happy Little Stampers October Christmas Challenge. So beautiful and I love the snowflake pattern background you made. That die is huge and so fun too and works wonderfully with the background. Just had a fun time looking through your work, WOW, it all so beautiful. I love that die - have it used it but not completed a card with it. You are better than me. Love how you used it and the amazing background. Looks fabulous. 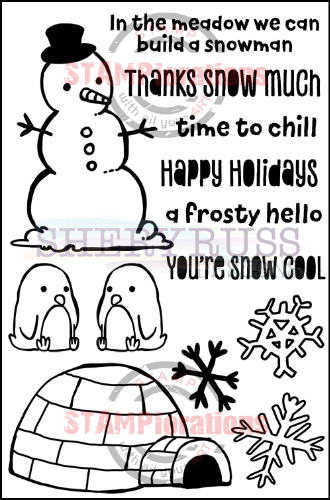 Thanks for sharing with us at Happy Little Stampers for our October Christmas Challenge Cornelia. Fun card and a great use of that die! I love that you chose a dark background, against which your washi looks amazing! So happy you played with our challenge at SIP! Words up Weekend with Stampotique! Snark with So Suzy Stamps! Halloween with So Suzy Stamps!